OMG. Salted Caramel is my new favorite thing. It is so good. I have always been a big fan of the sweet-salty combination, I’m very happy it’s grown in popularity over the past few years. Where I work is doing a week-long fundraiser to raise money for MS. One of our big events is a bake sale where all of our staff brings in homemade (or store bought if they’re lazy!) 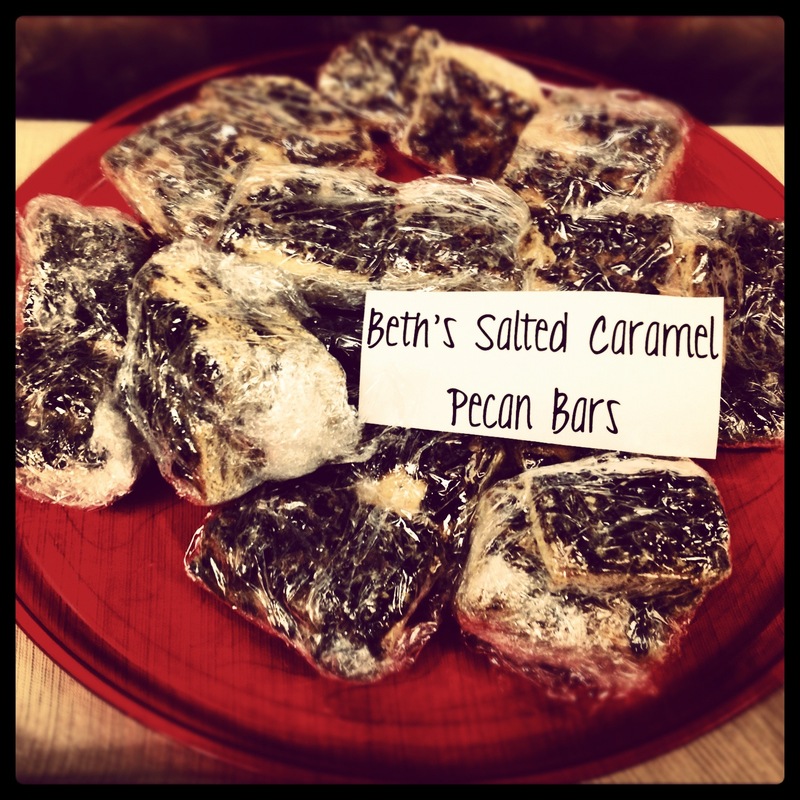 treats that we sell to our members for donations to the charity. Now that I’m doing this blog, there was a lot of pressure to make something interesting! After throwing around some ideas and searching in my database of hundreds of saved recipes, I came across this Southern Living reinvented classic and decided this was “the one”. And oh… believe me… it is… THE ONE. YUM!!!!! 1. Preheat oven to 350°. Bake the pecans on a foil-lined baking sheet for 10 minutes, stirring halfway through. Be careful, I almost completely burnt mine (they still tasted wonderful). 2. Line a 15- x 10-inch jelly-roll pan (I only had a 9×13 baking dish) with aluminum foil; spray the foil (Allow foil to go over edge 2 inches or so, you’ll need it later). 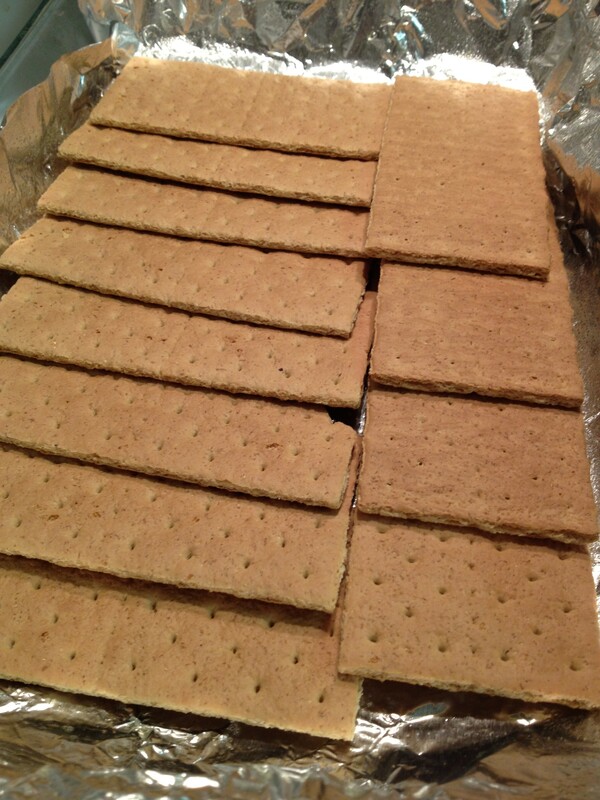 Arrange graham crackers in a single layer in prepared pan, slightly overlapping edges. 3. 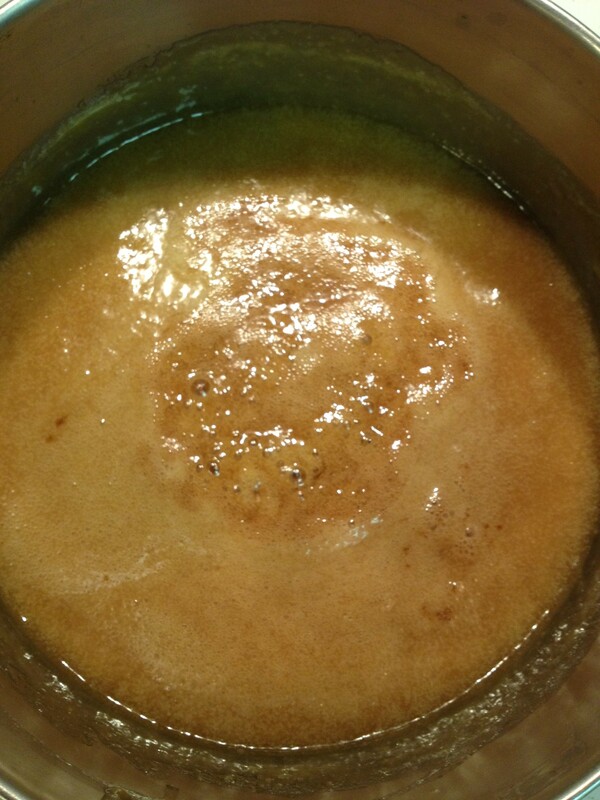 Combine sugar, butter, and cream in a medium saucepan; bring to a boil over medium heat, stirring occasionally. Remove from heat, and stir in vanilla and toasted pecans. Pour butter mixture over crackers, spreading to coat. 4. Bake at 350° for 10 to 11 minutes or until lightly browned and bubbly. 5. Immediately sprinkle with kosher salt, and slide foil from pan onto a wire rack. *This will be VERY hot. Be careful and use the foil, folding it to contain the bars and keep their shape. * Let cool for 30 minutes, at least. Break or cut and serve. I let mine sit overnight just out of lack of time, and then cut them the next morning. They were really sticky but they cut into nice little squares. For our bake sale, I wrapped two together into plastic wrap… put them all into a big bag and into the refrigerator. This kept them nice and cool, which was definitely needed since it’s been so hot lately! 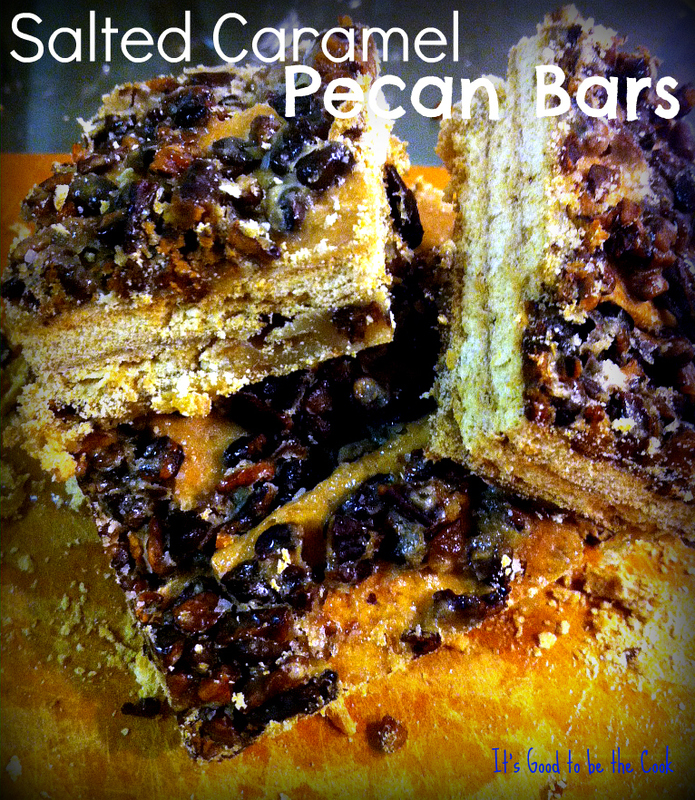 They were a big hit, and not to mention every one of my typical taste testers approved it too! Next time, I’d like to make more of the sauce. I think that part could have been a little thicker. Otherwise, they were fabulous. I loved the salt ontop. What a great non-chocolate dessert! For this Mother’s Day I wanted to make something really special for my Mommy! The funny thing about this recipe is that it calls for Bourbon TWICE. Let me rewind and tell you about Flambee. One of my Mom’s famous stories is how as a kid, she ALWAYS wanted to order her dessert Flambee. I guess they used to go somewhere that would do it tableside, and she would order it every time. The story goes, that every time she would order her Flambee, she would take one bite and hate it. She hated the taste of the liquor! We always laugh that my grandparents would let her order it again- but they did and of course… she did. 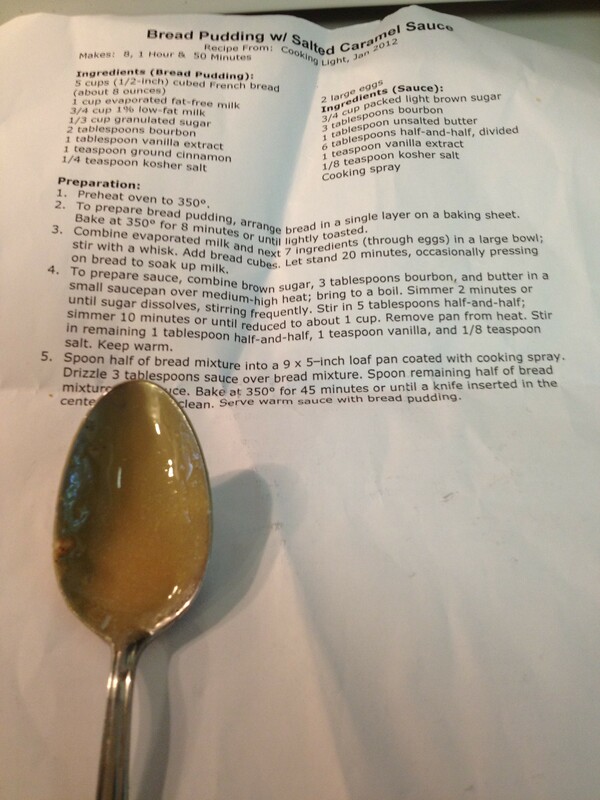 While I was searching for recipes to make Mom this year, the one I fell for has Bourbon… twice. OYE! Well this one was for Mom, so after reading the recipe a few times, I figured it would be OK to leave out the Bourbon. Let me tell you, it wasn’t missing anything! It was awesome! 1. Bake the bread on a cookie sheet in an oven preheated to 350. Make sure the bread is spread evenly on the sheet. Bake for 8 minutes or until it’s just lightly toasted. 2. 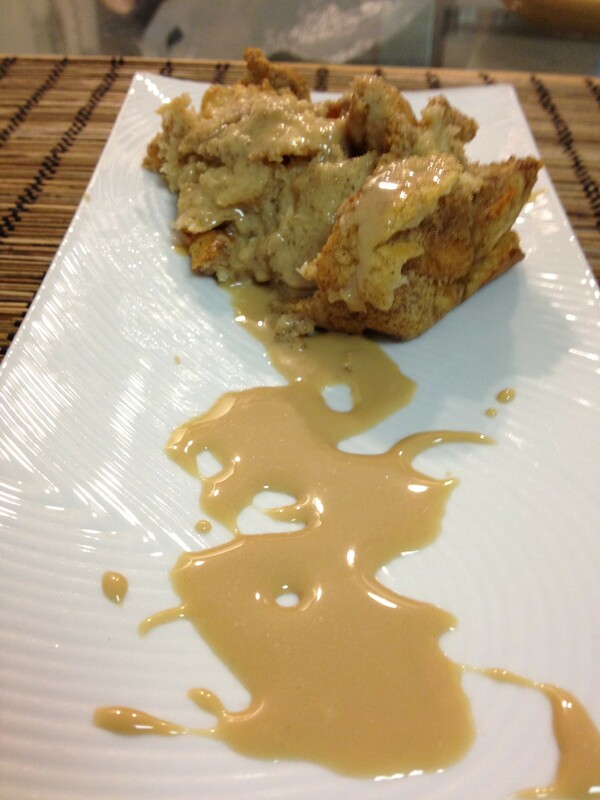 In a bowl, combine evaporated milk and the rest of the 6 ingredients in the Bread Pudding section. Stir with a whisk until well combined. 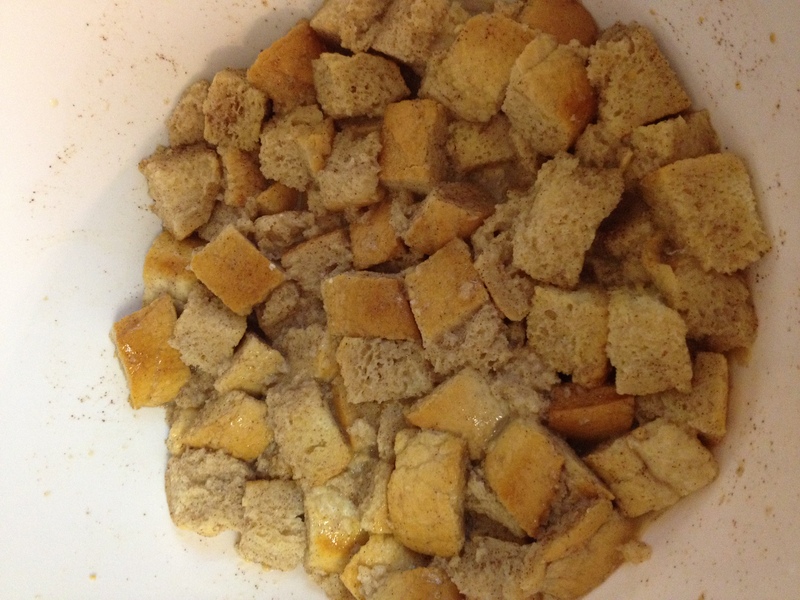 Add the toasted bread cubes and stir to coat. Let stand for 20 minutes while you prepare the sauce. Stir it around a few times or press on the bread to help it soak up the liquid. 3. 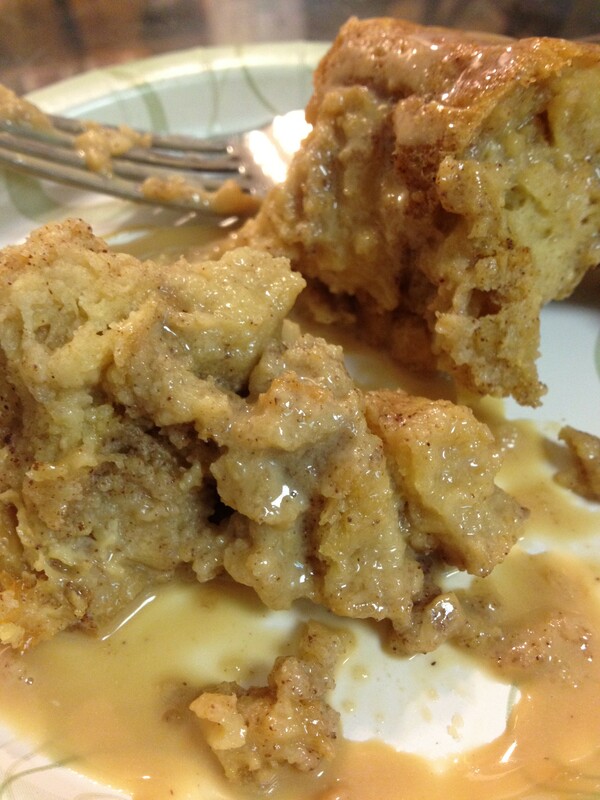 To prepare the sauce, combine the brown sugar, skim, and butter in a small saucepan over medium-high heat. Bring to a boil. Simmer for two minutes while stirring, or until the sugar is dissolved. Stir in FIVE of the Tablespoons of Half and Half. Simmer for 10-15 minutes or until it is reduced to about 1 Cup of liquid. Lower the heat to warm. Stir in remaining 1 Tablespoon Half and Half, vanilla, and salt. Stir occasionally keeping warm. 4. 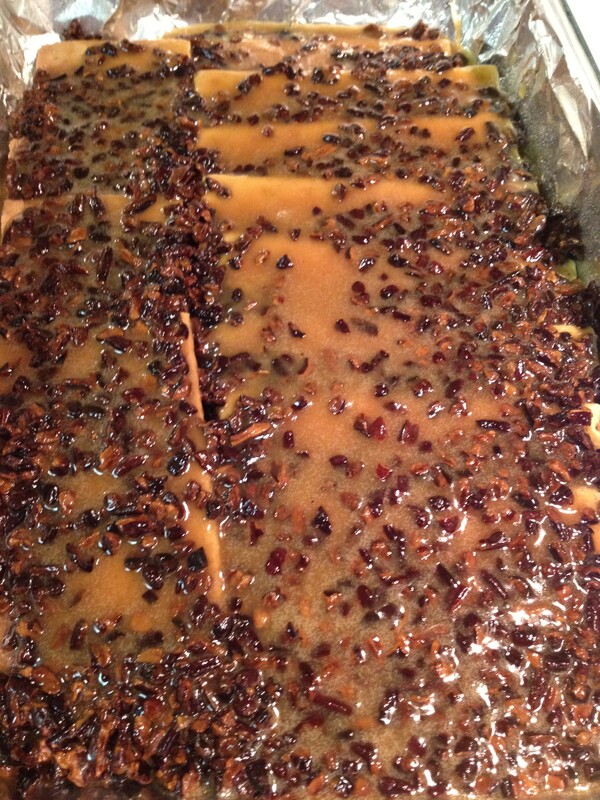 Coat a 9×5 inch loaf pan with cooking spray. Spoon 1/2 the bread mixture into the pan, then drizzle with 3 Tablespoons of the sauce. Spoon out the remaining bread mixture. Bake at 350 for 45 minutes. You’ll know it’s done when a knife inserted into the middle comes out clean. Serve with the warmed sauce. 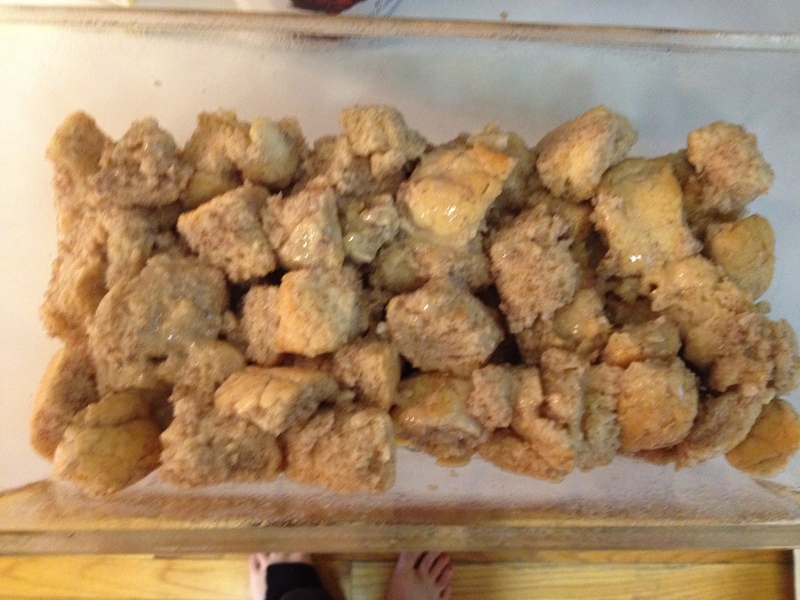 This is the bread chunks after they were soaking for about 15 minutes. The sauce was so sticky and sweet and yummy! 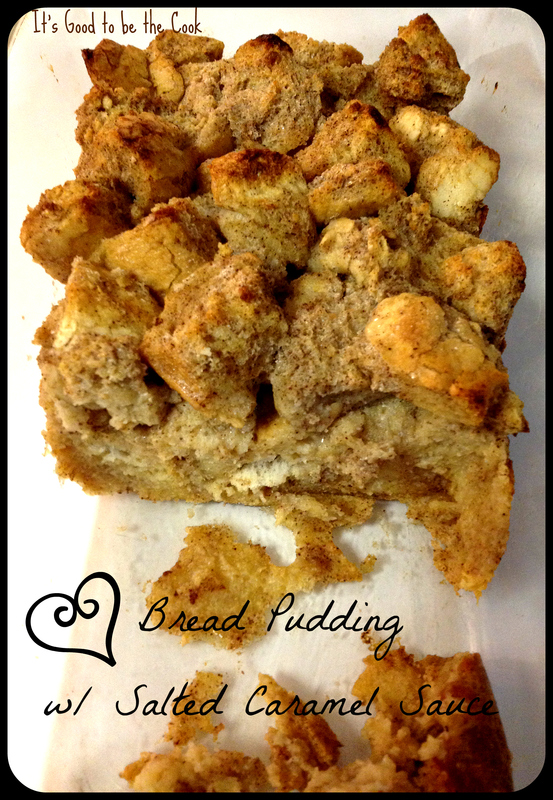 This is my first bread pudding ever! I’ve actually never even tasted one either. I imagined it to be more… pudding-y? This reminded me of a fancy French Toast. It was so delicious! I think the sauce could have been saltier to remind me of “salted caramel”. It was amazing but… just missing that extra zing adding just a little more salt would give! I also was so impressed at how easy this was to make. 1. I hardly had to buy any of the ingredients- I had most of them already! 2. The original recipe wasn’t that bad for you… and I replaced a few ingredients to make mine even better! Okay, it’s still not GOOD for you but it’s not that high in calorie considering what you’re eating! 3. I only dirtied like three things! So easy! The most important critic of the day, Mom (also my sister and Dave!) loved it. I hope all of the Moms reading this had a wonderful Mother’s Day too!